One of our customers had some problems with the new deployed VMWare Tools 10.0.5 on their W2k12 r2 Systems. The W2k8 r2 systems had no problems. 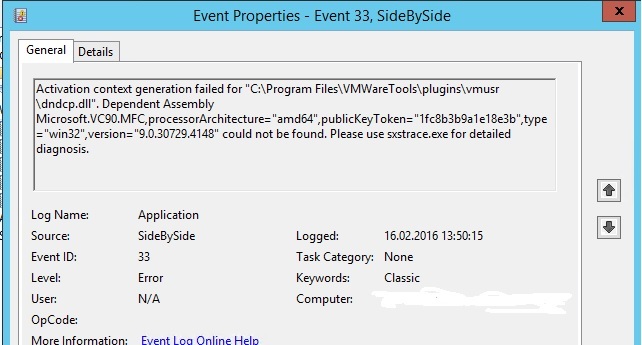 Activation context generation failed for “C:\Program Files\VMWareTools\plugins\vmusr\vmtray.dll”. Dependent Assembly Microsoft.VC90.MFC,processorArchitecture=”amd64″,publicKeyToken=”1fc8b3b9a1e18e3b”,type=”win32″,version=”9.0.30729.4148″ could not be found. Please use sxstrace.exe for detailed diagnosis. Activation context generation failed for “C:\Program Files\VMWareTools\plugins\vmusr\dndcp.dll”. Dependent Assembly Microsoft.VC90.MFC,processorArchitecture=”amd64″,publicKeyToken=”1fc8b3b9a1e18e3b”,type=”win32″,version=”9.0.30729.4148″ could not be found. Please use sxstrace.exe for detailed diagnosis. After searching a while I found out that this error message only appears when a new user logs in to the server. There was neither a VMWare Tools icon on the notification area visible. Most of similar problems where indicating that there is a problem with the Visual Studio for C++. First of all I used the SFC command (sfc /scannow) to check if all system binaries where ok. Did received no error from the system. A friend of me logged now also in to the system to reproduce the error. After he logged in, I saw the new event entries in the event viewer. Now I could stop the the tracing by pressing enter. ERROR: Cannot resolve reference Microsoft.VC90.MFC,processorArchitecture=”amd64″,publicKeyToken=”1fc8b3b9a1e18e3b”,type=”amd64″,version=”9.0.30729.4148″. I download it from the microsoft site and installed it manually. After installing it, I didn’t receive any more those errors. This seems to be the SP1 for the Visual C++ 2008 Redestributable package. But why this isn’t installed with the VMWare Tools package? Is this maybe not included in the package? After checking with the software packager of the enterprise, we found out that by installing only the MSI, the C++ will not be installed. When you install the software with the EXE, the C++ is preinstalled. After deploying those two packages, every w2k12 was running perfectly again.